For the campaign in Egypt in 1801 the British were going to need their artillery, both field guns and the heavier siege guns for the assault on Alexandria. The problem was they had very few horses as the Turks, who had been expected to provide these, produced only very poor examples of the species, and the best of these went to the cavalry and officers. As a result most of the guns had to be manhandled over often difficult terrain and in sweltering heat, and worse still most of the ammunition had to be carried in the same way, leaving the guns often out of position or chronically short of anything to fire. Despite these difficulties the artillery performed very well, and succeeded both in supporting the infantry in the field and battering the walls of Alexandria’s defences until that city capitulated. Looking at the men first, we find all but one wearing a coat with laced lapels open at the waist. This is correct, or at least it was for the mid 1790s, but around 1797 this was replaced with a coat without lapels and closed to the waist with five rows of bastion-style lace on the front. No authority suggests that this old uniform was still being worn by 1801, so we must conclude that these are wrong for this campaign. The coats on these figures have short tails, so it looks like the sculptor knew about the shorter tails and tried to match them with the older coat, producing a hybrid that is very odd. The coats also have wings on the shoulders - an item never associated with the Royal Artillery, so we are not sure why the sculptor thought this was appropriate. On their heads they wear a civilian-looking hat which was known as the 'Mother Shipton', and while this too dated to the 1790s it seems clear that some wore it during the Egyptian campaign and beyond, so this at least is reasonable. Many would have worn the bicorn or even the shako, but at least by making all wear the hat the figures in this set seem to be part of a single team. Leg wear for these figures varies, with some having breeches and gaiters while others wear trousers. This is reasonable, as is the variety of belts and items of equipment these men have. For the most part they are very lightly kitted, so for example none have the powder horn used for priming a gun, but it is easy to imagine these things put to one side while in action. However it means only the man in shirt-sleeves is properly done, and since the heat of serving guns during a hot Egyptian day can hardly be imagined he is also the most plausible. 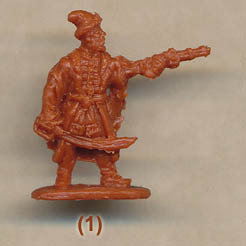 All the officer figures wear a broad-brimmed hat with a soft crest to give it a more military appearance. There is evidence that such an item was worn by an officer, and perhaps others, but there is no reason to suppose this was normal for the majority of officers, so again bicones should have been done here on at least some of the men. All the officers have swords and a sash, which is fine, but again they have the old-style coat which would not have seen service by this date. The last figure in the third row is something of a mystery. He wears trousers and a waistcoat and a bandana on his head. He has a coat of unclear style hanging on his shoulders, and carries what could be a cane, whip or even a match. We have no idea what this figure is supposed to be. Perhaps an officer, although he looks too informal for that. The poses are all reasonable, but our attention was drawn to the first figure in the second row, and in particular to what he is holding. On the face of it this would be a hand spike for manoeuvring the gun, but it has a thick square end quite unlike a hand spike and perfectly useless for that role. We could not find any indication of what this is supposed to be, so unless the sculptor simply forgot to finish this one we are in the dark as to what we are looking at here. The two guns in this set have a barrel of 24mm in length, which at 173cm is in the range of 6-pounder guns. The construction is standard, although the muzzle comes as a separate piece to provide a recess where the core of the barrel begins. The design of the gun and carriage is somewhat simplified but appropriate, and the sizing is OK too. We found we had to enlarge the slot underneath the carriage to allow the barrel to be set to the maximum elevation, but that was the only problem. The carriage model comes with the two axletree ammunition boxes as part of it. The usual Strelets sculpting means some smaller pieces and details are exaggerated, and there is an unrefined quality to the whole set. However the guns fit together well enough and at least there is no flash to dispose of. This set works reasonably well as British artillery of the 1790s, but not for the Egyptian campaign, which is a pity as that is what was intended. The box art shows us random images of marines and a man in underclothes, so there seems to be a great deal of confusion and vagueness about both the figures and the box they come in. For the Egyptian campaign there really isn’t much here that is of any use, so the set scores badly as a result. Those with an interest in earlier campaigns will find something for them here, but that is no consolation for those looking for the all-important artillery to match their infantry for this exotic of Napoleonic sideshows.